Last week I finished my latest "non-Litfuse, for my own reading pleasure book." Every once in a while I do get those in between other books I am reading for and from work. 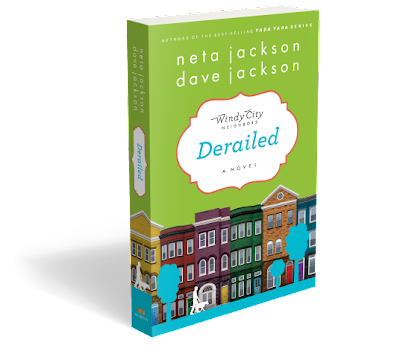 Today's featured book Derailed, book 2 in the Windy City Neighbors series by Neta and Dave Jackson (thank you Worthy Publishers). What's it going to take to get him back on track? After marrying Estelle, the love of his life, ex-cop Harry Bentley's apartment feels too cramped, especially since he's now raising his grandson. God seems to provide the perfect solution - a two-flat that would also provide an apartment for his elderly mother. But when plans go awry, Harry has to go back to work as a detective, receiving a bizarre undercover assignment that sends him across the country by train and raises suspicions about his own son's involvement in a major drug cartel. It feels like God keeps switching signals - left, right, stop, go? Each time Harry thinks he's following God's leading, his plans get derailed and he's left frustrated, wondering why God isn't helping out. Perhaps the only thing going right is he and Estelle are getting to know their new neighbors . . . but discover a block so disconnected one woman almost died unnoticed. Determined to make a difference, Harry and Estelle begin reaching out to their neighbors one plate of cinnamon rolls at a time. For more about Dave and Neta and their books, visit: www.daveneta.com. What I like is that in this series you get more than one point of view regarding what is going on with the story line. In other words, you don't have one narrator throughout the entire series. We also get visits from old friends we met in Neta's other series. What I don't like is that Derailed covers the same time frame as Grounded, so you actually know a good bit of what happens before you get to it. SPOILER ALERT if you didn't read Grounded... skip down until you see me typing in bold again if you don't want to see this. For example, I kept waiting for Harry's mother to die since I knew she wasn't going to make it much longer. I also knew he was going to run into Grace on the train and some of the blanks make sense. Personally, I think I might enjoy it more if the second book picked up where the first one left off or if you heard from more than one character per book. The Jacksons started doing the same kind of thing with parallel books with the Yada Yada House of Hope series (Neta) and Yada Yada Brothers (Harry Bentley series written by Dave), but I think it may have worked better then because it was two different series instead of one. For some reason, it just wasn't what I expected. And Harry seemed different somehow. I can't put my finger on exactly what since it's been a while since I read the last Harry Bentley book. With all of that said, I'm most certainly going to keep reading the series. I want to find out what happens with all the characters in the neighborhood and old friends from series past as well! Want to know more about the first book in the series, Grounded? Check out my review by clicking here. Book 3 will be Penny Wise... release date TBA. I received this e-book from Worthy Publishers via NetGalley.